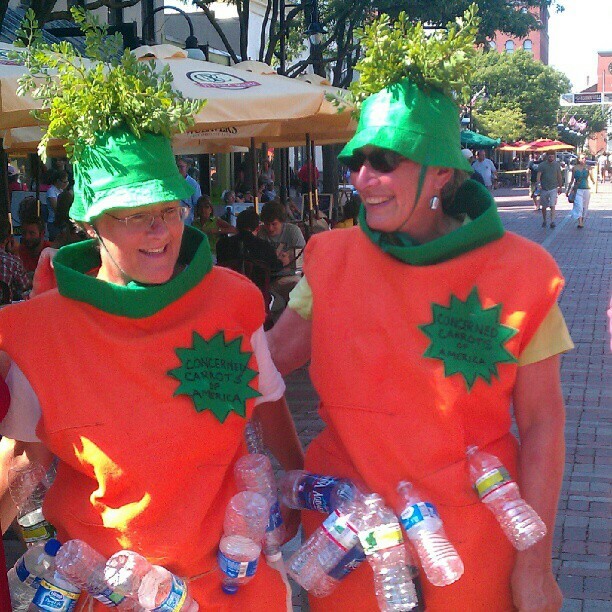 Concerned Carrots of America take on the water bottle issue! 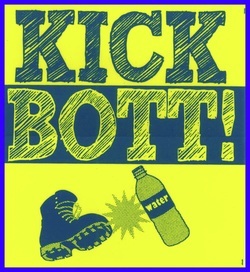 Kick the Bottle formed to bring awareness and education to the economic, social and environmental impacts of single use water bottles. An original goal of the group was to create a "tap map" of all of the places in the Burlington area one could fill up their own water bottle with tap water. We also hoped to bring awareness and promote the use of tap water at large events. 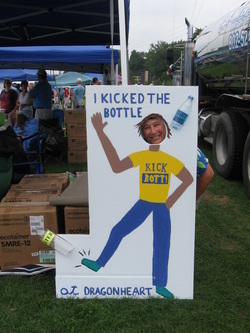 In the picture below I am at the Dragonheart festival on the Burlington waterfront next to a tanker of water which festival participants were encouraged to use to refill their water bottles. The two images on the bottom are stickers designed by Clare Innes of Chittenden Solid Waste District. They're made to put on your refillable water bottle and are still available by contacting me at leahwitt@burlingtontelecom.net.